The enactment(1) is a type of legal act or stylized performance located between everyday and public life. These are acts that refer to knowledge, economy and politics, in whose physical, spoken and semantic gestures social and cultural performativity, underlies a performance that operates these highly codified bodies, almost despite itself. As much in the past as in the present, and almost without opposition, these events have acted as material - in many cases of conscience - for certain aesthetic and televisual discussions in Argentine artistic production. 'Public Considerations, a Symposium in Three Acts' by Alicia Herrero, being a narrative scripted and articulated performance in three acts, returns us to that forum and to that conversation. If by a type of performativity, we understand the public enactment of an image, or the (re)presentation of a subject or subjects invested with authority to respond to rules, conventions and forms of justice and if, at the same time (as Giorgio Agamben suggests) this enactment 'objectifies' the forms of subjectivity within democracy, then it can also in some exceptions operate within a frame of illegality. If, facing terrorism, the enactment of the democratic state is articulated through the subjectivity 'of sovereign' then the frame of legality is inverted(2). In another sense, in art, by making these experiential acts or events an everyday tale of public life and the political web, it would appear that for them to be interpreted they have to remain in the hands of the protagonists, or of those who are interested in enacting politics. As much in the sphere of knowledge of those gestures as in their appropriation, the enactments require a familiarity with word and body as mediated by the gaze of the other, such as the production of agreed, accepted and stereotyped discourse, above all that of politics. In any case, they refer to that situation of speech that can in turn be naturalized (as ideology) by the audience with which one communicates. This is a situation that is undoubtedly located in diametric opposition to that other which, positioned within an illegality, either cannot conceive of the aesthetization of the political, or on the contrary, having received a highly stylized experience can do no more than observe and point out the skills and abilities of the performer's spectacle, without being able to decode its meaning. Therefore both political performativity and artistic practice require virtuosos or experts to unleash their skills and abilities in the articulation of a speech act (3), a script that makes their practice visible. In this way, Public Considerations, through taking the floor in the forum, not only sets the scene for the cameras but also employs them strategically as tools of mimesis and camouflage(4) to distribute or disseminate its ideas, which are divided between the diverse spheres of the production of meaning, knowledge of art and public life. In the first act of Public Considerations the auditorium of the Rojas Cultural Centre was converted into a space for the activation of knowledge and culture. The spaces became the scenario for a talk show for public debate. Fenced into this space of manoeuvre - which on occasion serves as the proscenium for L.I.P.A.C. (5) - artists, invited investigators and the public argued and debated. The argument and debate was specifically about knowledge, public university and the means that these spheres have to participate and intervene in the city's spaces; also about the role of the educator, of art and of the intellectual. The first act ends. Some months later, in the second act of Public Considerations, Alicia Herrero and the performers proffered the discourses that are heard on economy and art from a bank (the National Bank) or in the occupied square in front of the auditorium, in a locus recognized symbolically by the subjects that frequent the amphitheatre. Repeating the gesture with the intention of generating further discourse, the public participates, having being guided through the space by performers. The future debate is rehearsed in the bank's auditorium. Judgements are pronounced, the dissent of the panelists is heard, and participants are 'activated' through questions linked to work and economy. In this second act the resonances of the 'public' in turn come to the diagrams that design the value of the economy, of money circulating in the plazas, labour markets and the forms of social instability caused by the neoliberal residues. The bank(6) presents itself as a financial institution, where money is issued, exhibited, made visible, and also where 'everything sold dissolves in the air', passing to another state, liquid to circulate in the market of goods and services. In this act, art and capital is transformed into letters, fixed terms, interest, possible investment, subversion, patrimony (mine, yours, ours), lent, financed, frozen or corralled. All these are configured on the basis of a performance codified in the solvency, belief and values that depend on the subject(s) and their skills being employed in the repartition of the terrain of the economy that regulates everyday life. This scenario is the mise-en-scène of Public Considerations, a Symposium in Three Acts, which Alicia Herrero chose to take the specialists who understand the forms and values of money and of art to 'talk publicly' with their audiences. The second act ends. In the third act, which takes place in the congress, site specificity transforms the performance into an act of legality: a kind of legality that attempts to interfere between the forms of emancipation of the genre of art and the legal bodies of the represented community. 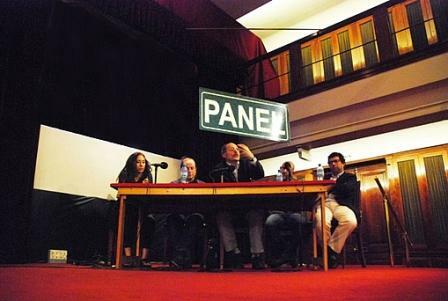 In the auditorium of the parliament, invited guests and the audience also participate in round tables, distributed in different areas (halls, the lobby etc), whilst on the stage a flag unfurled by Karina Granieri and Agustín Blanco the punctuated word E.M.A.N.C.I.P.A.T.I.O.N. is read. With this gesture both the space and temporality naturalized in the symposium and in the architecture that confers authority and centrality to the auditorium are automatically interrupted. Different focuses for debate and action are presented. We have activation once again. This time, the format of Public Considerations itself is extended to six hours. In this performativity transversal and horizontal structures of dialogue are presented and debated. It is a type of democratic act that creates a participative dynamic of rhythms and exchange of flows within the scenario of the National Congress. The performative artistic practice of Public Considerations vectorizes the action towards emancipation, creating spaces of dialogue and appropriation of both political reality and the new spaces for participation in modern-day Argentina. Through this mechanism of simulations and concealments, the artist does not resign the old conceptual practice to politics, but rather breaks it out into different artistic forms and means of symbolic production that rework the old genres. From a contemporary viewpoint that focuses on and updates 'the public' through diverse enactments and acts of speaking, the performance of Public Considerations works by camouflaging and mimicking the genre of these speech acts. The participants converse, chat, discuss, inform, communicate, debate, question, demonstrate, answer and at the same time respond(7) to situations of enunciation and production of meaning and ideas.